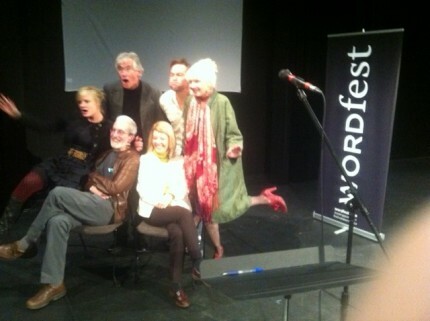 Just arrived in Calgary for Wordfest which this year has 70 writers and 65 events over six days in Calgary and Banff. Flew in with Julie Wilson, author of Seenreading, who was herself reading a new hot novel titled Malarky along with Russell Wangersky, whose book Whirl Away was shortlisted for the Giller. Good discussion in taxi ( kindly driven by Dennis a thoughtful festival volunteer who listened in) about the merits of Facebook versus Twitter, with Facebook coming out on top because Facebook allows for more discussion. Twitter, said my colleagues, often just repeats what an in group has already decided to think about a certain subject, whether it is politicos or literati speaking to each other. Another bon mot, this time from Julie Wilson who says it is no longer enough just to win the Giller; the writing community gets excited when there is the possibility of a triple win with the Rogers Trust and the GG fiction awards. Food for thought. Writing books as a sport takes a new up twist. Yikes.